Toilets, Kart shop and usually a burger van on test and race days. This web page is intended as a guide to the Clay Pigeon Kart circuit that is used by CLUB 100 for Sprint race days and Endurance race days. The circuit has been used since 1994 by C-100 and has always been a favourite for drivers and staff alike over the years. If the weather is nice, the track and the location are glorious but it’s a bit grim when it rains (remember 1996 and 1998!). Clay Pigeon is one of the most popular circuits on the CLUB 100 calendar and even if you don’t find the track to your liking, then the social side to the weekend is not to be missed. With the Endurance race held on the Friday, a lot of the teams and Sprint drivers decide to make a weekend of it and spend at least the night before (or after the races) at the very pleasant town of Dorchester in Dorset (or stay at other local towns close by). As well as the regulars who compete in both events, a few more Endurance racers tend to make a weekend of it and also compete in the Sprint event as well, such is the popularity of this great circuit. So what makes the circuit so great? Well its fast, open and leads to plenty of great overtaking. The circuit is nice and wide with plenty of run-off areas and it combines lots of fast corners with a few technical hairpins, although these hairpins are not your traditional tight ‘hairpins’. The circuit will not disadvantage the heavier drivers as much as circuits such as Rye, Wheels or Bayford due its fast nature and that should enable the Endurance event to be a very open race indeed. There have been some classic races here over the years. For those with a long history in C-100, the thrilling HW A final battle between Dave Berney and Steve Dart back in 94 (resolved in Berney’s favour) was a classic as was the 1996 A LW final finally won by Malc Smith. Marc Craddock and James Winslow were awesome in the wet in 1998, both blitzing the opposition while the 1999 LW A final battle between Adam Selby, Marc Craddock and Luigi Mazza was a thrill to watch. But the one race that stands out most, was the 2000 HW A final that saw 6 drivers fight out an epic race with Mark Terry finally storming through from grid 10 to win the best race of his career. For the Endurance event, the start line is right in front of the pits but we use the ‘other’ start / finish line just before the final corner (turn 7, top bend) for the Sprint events so the karts can come straight back into the pits after the race. The pit entrance is just after turn 7 and it is important to warn other drivers that you are coming into the pits by raising your hand and pulling to the left-hand side of the circuit on the approach to turn 7. The pit lane is nice and long and leads itself nicely to getting the races ready in the Sprint event. It is worth pointing out that Drivers should make sure that they glance to the right when exiting the pits (more relevant in the Endurance) to ensure there is no oncoming traffic at full speed on the main straight! Drivers should also keep to the left-hand side of the circuit when exiting the pits in order that those at full speed on the circuit can drive around them. 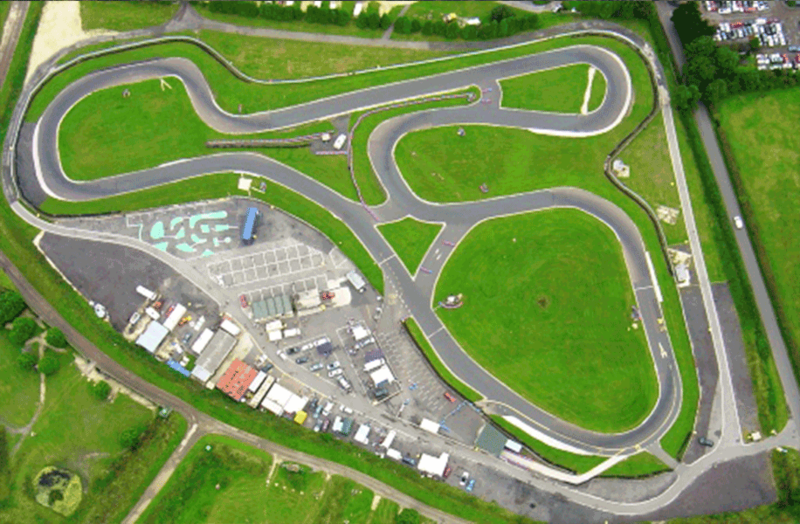 CLUB 100 usually change the gearing for this circuit, and this means you will find the karts slightly slower out of the corners but really quick at the end of the long straight, with speeds reaching around 75pmh as you reach the exciting Billys Blind at the end of the main straight. With this in mind, it is important for a sensible approach to racing at this point of the circuit as a big off at this point of the circuit can be rather …….. well, exciting to say the least! The key to a quick lap is turn 7 that determines your speed down the main straight and it is worth watching the quicker drivers through this corner to work out braking, turn in and accelerating points. Other key corners are turn 2 and the chicane, this latter corner again determining your speed on the second longest straight that is where the most overtaking takes place. On the rolling up (formation) laps, CLUB 100 use the full circuit for the Endurance and for the first lap upon exiting the pits in the Sprint. There is a cut-through on the exit of turn 5 (Horseshoe) that can be used to catch the pack up and this cut-through is also used in the Sprint event as a mini oval on the top half of the circuit for the remainder of the roll up laps. As always, look for instructions from the officials and ask the drivers doing the track walks for clarity on this issue, although it should be covered in the briefing as well. In conjunction with the excellent report written below by Paul Hicks, we suggest that you attend the track walks that take place before each Endurance event and in the morning of the Sprint events. This will enable you to get an even more detailed analysis of where to position the Kart on the circuit, brake and accelerate as well as understanding the key overtaking places on the circuit.